I had to think long and hard to recall Ralph. Condolences to his friends and remaining family. May he rest in peace. RFP 747 was one of the classics of the early days of MSFS. Ralph's work was excellent and ranked up there with PIC 767. Ralph of gracious as well, allowing RFP 747 to pass over to freeware and still available here on AVSIM. Condolences and thoughts to his family and friends. I loved Ready For Pushback. Thank you, Ralph. And good-bye! Spent many years working on the RFP test team and it was always a pleasure to work for Ralph. 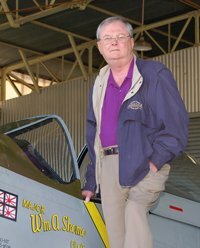 A dedicated man to the Flightsim community and the King of the "Queen of the Skies". Condolences to his family , his friends and those that had the pleasure of getting to know him through the RFP team . My condolences to Mr. Ralph and his family. His Md-83 panel was amazing. Great person and did not mind helping at all. I was working with him on many projects, and it was always a great pleasure for me to work with him. He was a great person and a good friend of mine. My deepest Condolences and my thoughts to his family and friends. Condolences to Ralph's family as they mourn his passing, may his eternal soul rest in peace. I admired Ralph's work especially for his development the Dash 8 panel for FS98 which had a good representation of the autopilot system. Agreed, RFP was a great addon. One of my first purchases I believe. RALF747 cleared to the stars, frequency change approved. Ralph was a giant in his day. 747 Ready for Pushback was one of the first real study sims for MSFS, and it remained popular long after it was out of date. Ralph was also deeply involved with Globe Cargo VA, which originally was built exclusively around 747RFP, but later expanded to other study sims as well. His work touched many people.